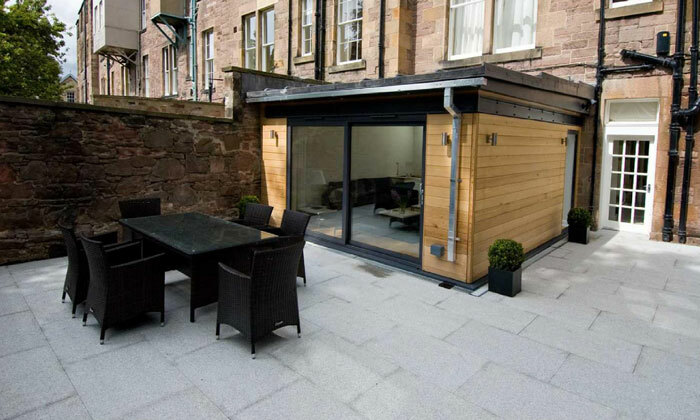 Crisp outdoor rooms for a large city garden with modern extension. This was a large, walled city garden with unusable sloping ground and access only through the house with a modern extension being added that put the garden under pressure to match up. The quality and views of the property were much improved by the modern extension but the garden then had to relate to both a modern feature and a traditional stone setting. The client needed a useable and more manageable garden with an outdoor room, completed in one phase with a limited budget after their extension expenses. I created a design to their budget that combined traditional and contemporary materials and details and achieved a generous outdoor room. The character and spaces are in proportion with the property and offer a fitting outlook and appeal from the extension. Drainage details, walling and product choices were key to the success of this project. The client was thrilled with what the finished outdoor spaces added to the property complementing and enhancing both the traditional and modern aspects.